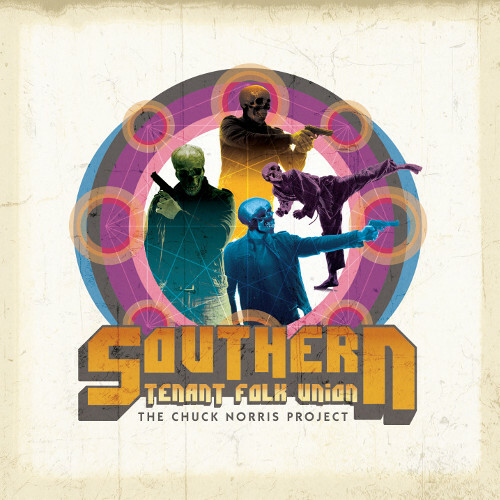 It’s a testament to how far the Southern Tenant Folk Union push the boundaries of folk that their sixth album features tracks all named after Chuck Norris films and they can make a banjo sound like a John Carpenter soundtrack. In fact musically the album may feature mandolin, fiddle and aforementioned banjo but the Chuck Norris Project seems a long way from folk, with jazz, soul and funk among the genres that weave in and out of these songs. The added use of clarinet and orchestrated violin, along with cello, give it an epic soundtrack quality as well. But do not think that this is a series of covers of 80s action move soundtracks. While all tracks are named after Chuck Norris films they are not about the right wing Hollywood hardman, who once proclaimed that electing Barack Obama as President would bring “a thousand years of darkness.” Instead these films, with titles such as The President’s Man, Slaughter in San Francisco and Invasion USA are used as jumping on points for a range of weighty modern issues from gun control to terrorism and equality. For those that enjoyed their last album, 2013’s post apocalyptic themed Hello Cold, Goodbye Sun, this acts as a fine follow up with even more musical invention and a similar ‘end of days’ feel driven by a genuine fear from band leader Pat McGarvey of Norris’s right wing take on world politics. Among the many highlights are the clarinet and beautiful vocals from Rory Butler on Octagon, one of the album’s slower tracks. His vocals also add genuine emotion to the heartbreaking Slaughter in San Francisco, about the continuing horror of school shootings in America. The seven minute long orchestral Martial Law is another high point on a truly original album. Given McGarvey’s passion for cinema music (he is also a member of the Incredibly Strange Film Band) surely it’s about time STFU were commissioned to produce a movie soundtrack? Although for political reasons I suspect Norris himself may pass on using them for any of his future releases.